Mini brewery and microbrewery TURNKEY - Brewing Systems for restaurants, bars and hotels, pub equipment for brewery. Company "EQUIPMENT FOR BREWERY" produces quality European equipment for the production of beer: microbrewery, mini breweries restaurant destination and industrial brewery turnkey. Productivity of our mini brewery equipment is from 200 liters / day to 35,000 liters / day. Productivity of our breweries can be easily increased. The company also offers various beverage filling lines. 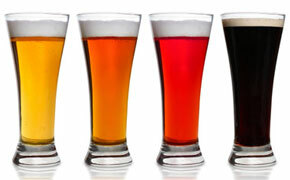 Term of production microbrewery, mini brewery or brewery plant does not exceed three months. Brewing equipment is supplied to a customer's enterprise in a complete package and installed turnkey. The cost of equipment includes: installation, technology and four varieties of beer, staff training, annual maintenance, supply of quality raw materials for the price. 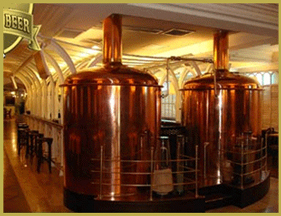 Exterior design mini brewery or microbrewery: polished copper, stained wood, stainless steel. Selling the brewing equipment is carried out for the euro. Prepayment 40%, the remaining 60% after preparation for shipment. The cost of transportation is not included in the cost of the brewery. For transportation of the brewery needed from 1 to 11 for heavy trailers. We can arrange transportation of the brewery on your company for a fee. Breweries of our company are designed for cooking "live", filtered and pasteurized beer. Living beer - this is an excellent taste, color and only natural ingredients. Restaurants microbrewery, established in the restaurant, bar or hotel are also a great advertising and design. Industrial breweries are able to supply beer to your unique surroundings. "Equipment" from 1997 supply to the market of the CIS and Western Europe brewing equipment (mini breweries, microbreweries, brewery plants), packaging and bottling equipment. © Equipment for brewery 2010.